Though bull fighting is associated most closely with Spain, bull fighting had a brief life across the ocean in the South American country of Uruguay. Built in 1908 as part of the larger Real de San Carlos Tourist Complex, the Moorish style bull ring or “Plaza de Toros” opened for locals in 1910, with bulls – as well as bullfighters Bombita Grande and his brother Bombita Chicos – shipped all the way from Spain to perform the in the bloody entertainment. The ring itself was 50m in diameter, and had seating for over 8,000 spectators. People came all the way from Argentina to see the spectacle, however there were only eight bullfights held here between January and March 1910 before a government decree banned them forever. 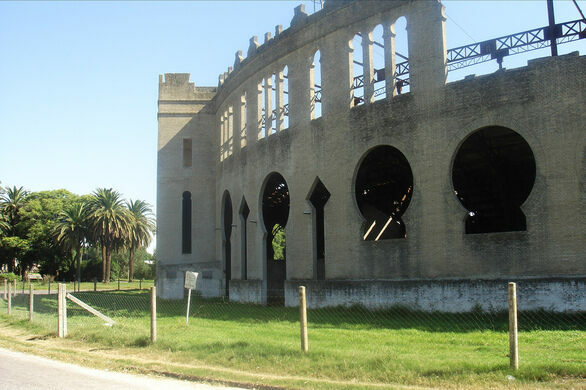 The Real de San Carlos complex included not only the bull ring, but a hotel casino, a ferry dock (for carrying tourists from nearby Buenos Aires) and a huge “pelote basque” building (“fronton”). The casino began operating after the bullfights were forbidden, and the whole complex only operated until 1917. Today only a racetrack from the complex is still in use. 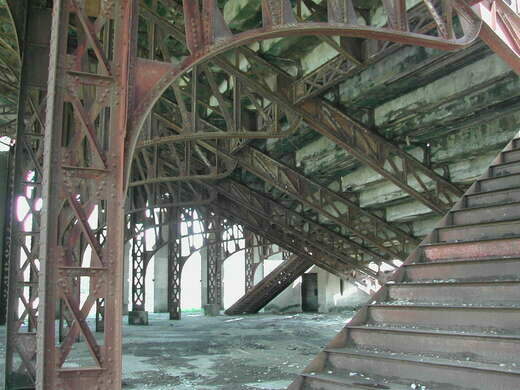 Technically, it is forbidden to enter the abandoned bull ring for safety reasons. Alejandro Carre Ale, La Colonia del Sacramento (Agrigento Ediciones), 1995.